The photo below shows the old cowshed, with other farm buildings in the middle ground. 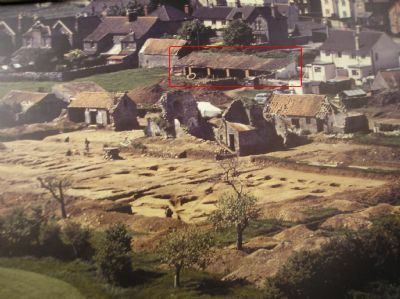 The foreground shows the site when archaeological work took place prior to the building of The Kings of Wessex School in the early 1960s. Over the years, the building has been used as a classroom, including an ICT suite in the early days of computers in schools. Before the IT4TT restoration began it was used as a store room and it took a lot of imagination to envisage it as the professional looking, fully accessible, training centre it now is. Click here to see photos of the transformation of the building.